Are you interested in the Roman Empire and ancient history? Do you love wine, shopping and delicious food? 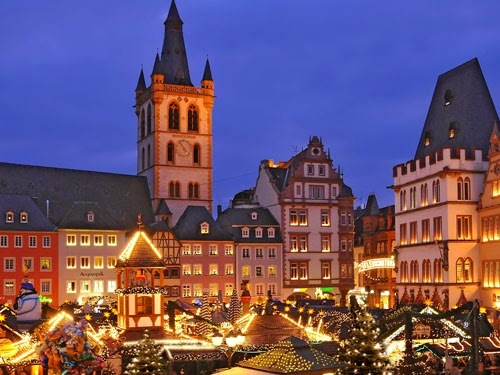 Then let us take you on an unforgettable journey to Trier, Germany! 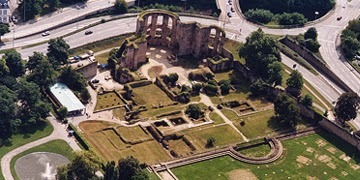 Trier was founded in 16 BC as Augusta Treverorum during the reign of the Roman emperor Augustus Caesar. It is Germany's most important site for classical monuments and art treasures. There is no doubt that the Romans designated Trier as a city rather than a settlement. Seven of the monuments have UNESCO World Heritage status and art treasures have been preserved and tell of fascinating times gone past. 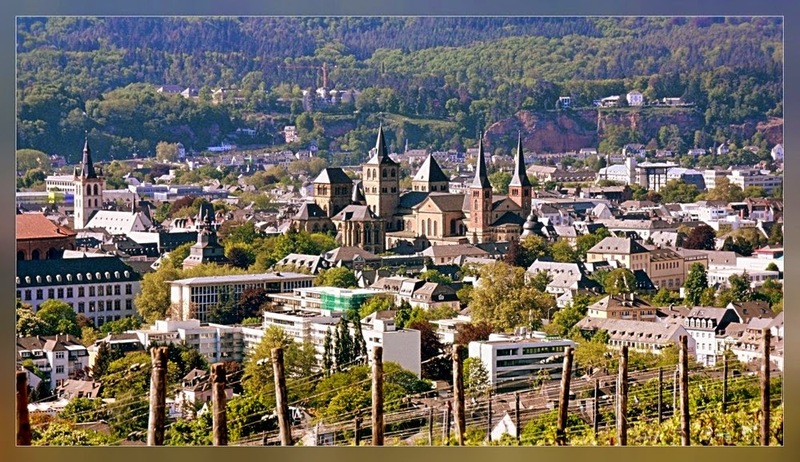 It's being said, Trier is the oldest city in Germany! It definitely has the oldest ruins outside of Rome! 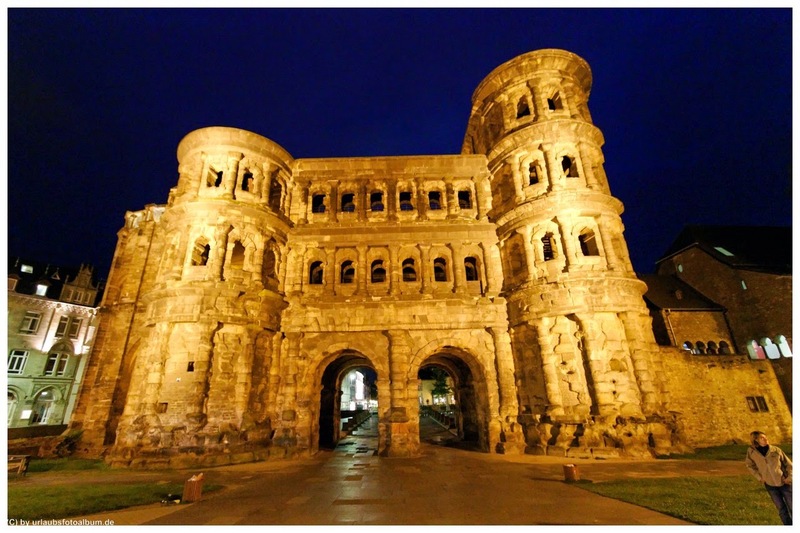 Starting with the Porta Nigra (Latin for "black gate", you will see at daytime that the stones look black) - the best preserved city gate from antiquity and today the most famous landmark in the city. The amphitheater, the famous Imperial Thermal Baths (Kaisertherme) where the Romans went to relax, remnants of the St. Barbara Roman Baths form the second century and, just as old, the Roman Bridge, which is still part of a main road into the city (now, this is some serious civil engineering! ), they all bear witness to Trier's extensive classical heritage. Just as impressive are the medieval buildings such as the Cathedral of St. Peter (the oldest in Germany) and the early - Gothic Church of our Lady. Trier's other historical sights include medieval Hauptmarkt square with the Steipe building, the Red House, St. Gangolf's Church and many more. Karl Marx was one of the great German thinkers and philosophers. 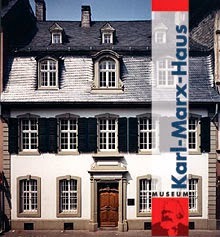 His birth place, the Karl Marx Haus, is worth a visit regardless of your ideological standpoint. With all those beautiful sights and interesting facts, one should not forget to shop, right? We recommend the shops in "Neustrasse", all these boutique style stores offer individually selected or even hand crafted goodies, you wish you could take them all home. With names like Rapunzel, Fraeulein Prusselise or Kreisel (dreidel) for a toy store, it shows the individuality of these shops. 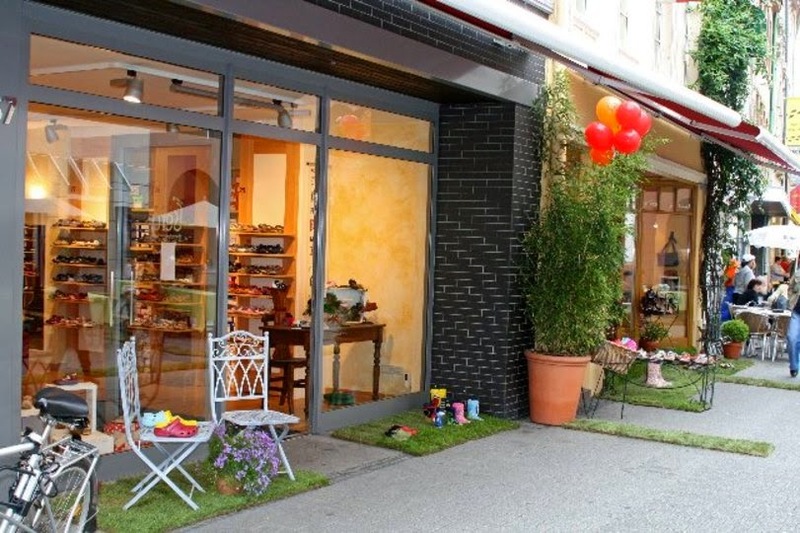 Check out the boutique "Lieblingsstuecke" , we are sure you will find an accessory that still fits into your suitcase. 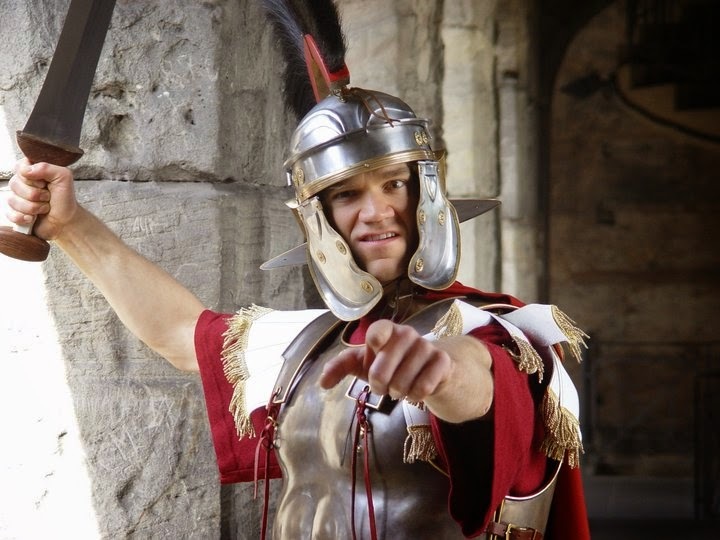 If you are looking for a fun and adventurous tour, go to the tourist office right next to the Porta Nigra and book an adventure tour which will take you back in time with themes like "Secrets of the Porta Nigra" or a walk together with Gladiator Valerius to the Amphitheater where he tells you about the dungeons and his life as a gladiator, we are sure you will find something you are interested in. Trier's proximity to its French neighbor and Luxembourg is noticeable throughout the city, especially when it comes to eating and drinking. Outstanding restaurants of international standing offer an unparalleled dining experience. Start the day with an excellent breakfast buffet at the "Jahreszeiten" in Petrisberg, which also is the perfect spot for lunch and dinner with seasonal offerings to satisfy any palate. If you would like to take your beloved one out for dinner, we recommend the restaurant " Schlemmereule " with an exquisite wine selection of the neighboring wineries or visit the wine bar at "Becker's" with a selection of more than 60 local and international wines, their restaurant holds two Michelin stars. For a more casual dining experience, we recommend two wonderful authentic Italian restaurants: "Da Massimo" in the Eurener Strasse and "Quo Vadis" in the Neustrasse. How about a wine tasting? The "Cask Cellar of the Bischoefliche Weingueter (BWG) " which is located directly underneath the center of Trier's old town would be our recommendation. The cellar covers 30000 square meters and its history goes all the way back to the year 600 AD. Once you descend down in the historical vaulted cellar, built by the Romans, there is an impressive view - 240 traditional Mosel casks, called "Fuder", are being stored here. Running through the oldest part of the cellar is an historic water line from the Romans. Over 1400 years ago it led directly to the nearby "Imperial Baths" (Kaisertherme). All these excellent wines from the Moselle, Saar and Ruwer area are of course very much in evidence and delight visitors to the many wine festivals and town celebrations. The annual highlight is the Moselle WeinKulturZeit, a month - long series of wine, gourmet and cultural events. You can sample excellence of all kinds in and around Trier - so why not spend the whole month here? Trier is a thoroughly young and vibrant city thanks to its two universities and strikes a wonderful, lively and appealing balance between its past and present. Shops, cafes, bars and bistros across the city invite visitors to stroll around or watch the world go by. When it comes to nightlife, dancing in the Zebra Cluba or Metropolis is an option or check out the website www.hunderttausend.de for daily updated events. There are many ways to visit Trier - as an individual tour by car, easy train ride or even as a stop on one of our famous river cruises.